Nappanee City Hall is located at 300 West Lincoln Street, Nappanee, IN 46550; phone: 574-773-2122. Photo: Frank and Katharine Coppes House, ca. 1893, 202 East Market Street, Nappanee, IN. 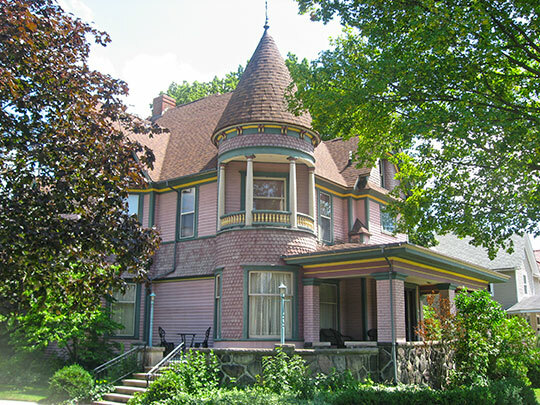 Listed on the National Register of Historic Places in 1990. Photographed by User:Nyttend (own work), 2013, [cc0-by-1.0 (creativecommons.org/publicdomain/zero/1.0/deed.en], via Wikimedia Commons, accessed August 2015. Located in the fertile farmland of the headwaters of the Wabash River in northern Indiana, Nappanee (Elkhart County) is a thriving small city that marks the southern gateway to the Northern Indiana Amish Country. Prior to 1800 Nappanee was home to the Miami and Pottawatomi Indians. In 1830, the first white settlers came to the area and by 1870 there were seven farms and a population of forty providing the nucleus of a growing community. The major catalyst for growth would come with the B & O Railroad in 1874. Three pioneer farmers gave five acres to the Railroad for $1 to build a station along its new route to Chicago. This access to a major transportation route brought more settlers to the town that B & O dubbed "Nappanee." The families who populated the area were deeply religious and conservative, founding their community on the values of hard work and integrity. Nappanee, Indiana Parks and Recreation, 2013-2017 Master Plan and Management Strategies, www.nappanee.org, accessed August, 2015.